Three music brands have combined forces to give songwriters and artists of various genres a chance at a coveted $20,000, one-year publishing contract. 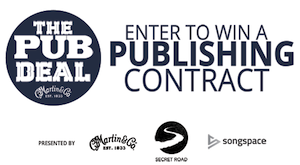 Management company Secret Road, Nashville-based music tech startup Songspace, and instrument maker Martin Guitars have teamed for the second annual “Pub Deal” contest. In addition to receiving a non-recoupable $20,000 advance, the winner will work with Secret Road during the year to build their repertoire and market songs for film and television. Twenty-five finalists will be featured on American Songwriter‘s website. Five finalists will participate in an audition that includes a series of interviews with Secret Road’s staff and co-writing sessions with top songwriters. The deadline for entering is May 3, 2014, at 11:30 p.m. CST. The contest will be powered by Songspace, a Nashville-based startup and partner company of American Songwriter Media. Songspace provides a song catalog for music businesses fed by a collaborative app for songwriters. Secret Road is a Los Angeles-based music licensing, publishing, and management company that has placed songs in television shows including Grey’s Anatomy, Parenthood, and Pretty Little Liars, as well as the films No Strings Attached, What to Expect When You’re Expecting and Something Borrowed. For application information, visit thepubdeal.com.